Detective Ryan Fitzgibbons, an eight-year law enforcement officer with the City of Chicago Heights Police Department, is a dedicated volunteer and fundraising coordinator for Special Olympics Illinois. Detective Fitzgibbons first became involved with Special Olympics of Illinois around 2009. She was recruited to participate in the Polar Plunge for Special Olympics at Manteno Lake and since then has been hooked! During this time, she met some of the Special Olympic athletes and found herself beginning to "feed off their energy." One of those athletes is local champion, Jillian Angell. Jillian Angell is not just a multi-gold medal winning Special Olympic athlete, she has also become a close friend and source of inspiration for Detective Fitzgibbons. “Jillian has a light and a drive that doesn’t just inspire you, it pulls you in next to her,” said Det. Fitzgibbons. Since taking over as coordinator of the Chicago Heights Police Department Special Olympics of Illinois activities, Detective Fitzgibbons has averaged $12,000.00 yearly in fundraising donations to the charity. She began 2017 coordinating the Polar Plunge event at Manteno Lake during the coldest part of the year. In the spring, Det. 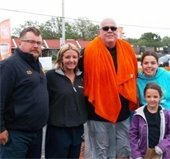 Fitzgibbons coordinated the Cop on Rooftop Fundraiser and as summer approached, she led the way in the Torch Run. This year’s Cop on Rooftop event was no different. Even in the unseasonably cool temperatures, residents and Olympians showed up in support of the officers sitting on the chilly rooftop of the new Halsted Street Dunkin’ Donuts. Some took a shot at dropping Mayor Gonzalez into the frosty waters of the dunk tank. Four of those brave supporters were successful.